At Benebone, we started with the premise that dogs experience scent and flavor in a way we can't even grasp. So, we ditched the neon colors and loud squeaks. Inspired by the dog's powerful sense of smell, we developed a long-lasting durable chew that's jam-packed with real flavor. Once your dog takes a bite of our USA-made chews, he'll be hooked. While recognizing that weight limit is a rough guide, our small products are for dogs under 30 lbs, our medium products are for dogs under 60 lbs, and our large products are for dogs under 90 lbs. Always choose the largest size your dog can handle. The Maplestick is a durable chew toy. 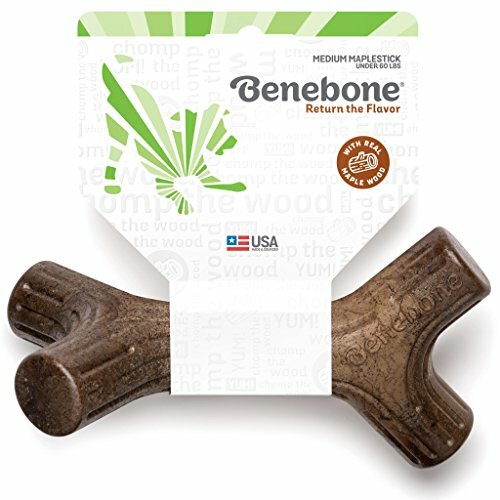 But given its wood content, it has a bit more "give" to it than Benebone's other flavored nylon chew toys. Reach out to Benebone with any questions or concerns. Benebone nylon chew toys carry risk. They are for dogs only and are not to be eaten. Chewing should always be supervised. Discard after reasonable wear. Benebones may cause an allergic reaction in humans or animals that are allergic to one or more components, such as nylon, peanuts, chicken or pork. For more information, see benebone.com/safety. Real Maple Wood - We use only 100% real flavor in our nylon chew toys. In this case, it's nothing but 100% USA-sourced nylon and 100% USA-sourced real maple wood. Did you know the Sugar Maple is New York's state tree? Every Maplestick is Made in New York. Made in the USA - We are fully committed to Made in USA, including packaging, tooling, and all material and ingredient sourcing. Dog Welfare - We are fully committed to the welfare of dogs through product donations and community involvement. Durability and Safety - The Maplestick is a nylon/wood mix. While durable, it has a bit more "give" than our other flavored nylon chew toys. Benebones are not edible. Supervise closely and discard/replace when appropriate. As always, reach out to Benebone for questions or concerns. We're here to help. If you have any questions about this product by Benebone, contact us by completing and submitting the form below. If you are looking for a specif part number, please include it with your message. Crocodile Sensory Dog Toy. 100% natural rubber (latex). Lead-free & chemical-free. Complies to same safety standards as children’s toys. Soft & squeaky. Best dog toy for medium and puppy dog.